Alnwick Harriers Phil Hall and Justine Norman in the Druridge Bay parkrun. Alnwick Harriers were in action home and away at the weekend, with runners spread far and wide. Close to home, more than 200 runners took part in the Druridge Bay parkrun on Saturday. Alnwick Harrier Bev Blythe in the Druridge Bay parkrun. Millie Breese continued her impressive form by finishing first female in a very good 19.50. She was also first overall Harrier, finishing ninth. Next home was Robert Baddeley in 22nd followed by David Barnes in 37th. Next female Harrier home was Alice Tetley-Paul, who just held off Jo Powell. Also of note, Mel Steer won the female 50 category. Results: 9 Millie Breese, 19.50 (82.10%); 22 Robert Baddeley 20.56; 37 David Barnes 22.20; 40 Alice Tetley-Paul 22.40 (65.37%); 42 Jo Powell 22.54 (69.36%); 51 Chris Stewart 23.44; 58 Justine Norman 23.59 (67.55%); 59 Bev Blythe 24.00 (66.18%); 60 Neil Hamilton 24.01; 61 Phil Hall 24.02 (58.53%); 62 Mel Steer 24.04; 82 Louise Callaghan 25.26 (70.26%); 114 John Ross 27.16; 126 George Williams 28.21 (61.49%); 127 Jennifer Knight 28.25; 166 Lorna Stephenson 31.30 (51.96%). 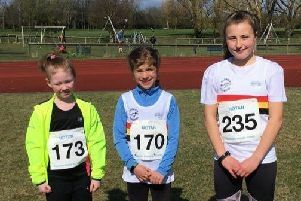 Down at York, Junior Harrier Joseph Godden was 35th in 20.26; up at Aviemore, David Henderson was 16th in 22.30; Junior Harrier Hannah Taylor was 62nd at Rutland Water in 23.42; and Kim Bronze was 194th in a big field at Sheffield Hallam in 25.19. Later that day, five Harriers were in action at the four-mile Powburn Show Hill Race. Mike Telfer won the family battle by beating son Ollie. Kim Moralee, formerly Redpath, was our sole female and finished ahead of Ian Stephenson and Mark Hume. Results: 15 Mike Telfer 30.24; 31 Ollie Telfer 32.34; 46-Kim Moralee 36.00; 48 Ian Stephenson 36.45; 71 Mark Hume 52.36. The following day, Shaun Land had a really good run at the South Shields 10 where he finished 13th of more than 450 runners in a splendid 1.06.14.